QuickTake: How Often Do Patients Discuss Sensitive Issues with Their Providers? Survey respondents were asked whether they had spoken to the doctor or other health care provider they see most often for their health care about sensitive issues within the last 12 months.3 The survey questions build on questions in the Consumer Assessment of Healthcare Providers and Systems (CAHPS) survey.4 We limit the analysis to adults who saw their usual provider at some point in the last 12 months.5 The sample size for the analysis is 2,107 nonelderly adults. We examine how often adults reported discussing potentially sensitive topics with their providers overall and across population subgroups based on family income and the presence of health problems. Conversations about sensitive issues may be particularly important for patients with lower incomes and for those with a chronic condition or disability. More than half of the nonelderly adults in the sample (55.3 percent) reported discussing at least one potentially sensitive issue with their usual provider in the last year (figure 1). Conversations about life challenges and stresses (42.8 percent) and problems or concerns about their health and health care (36.3 percent) were most common. Fewer than one in five adults reported a conversation with their provider about concerns about the cost of health care. Although we donâ€™t have information on whether the adults would have liked to talk to their providers about the cost of care, 21.0 percent of the adults in the sample who did not report a conversation about cost reported going without needed health care because they could not afford it over the past year. This includes 9.4 percent who reported unmet need for doctor care and 10.7 percent who reported unmet need for medical tests, treatment, or follow-up care (data not shown). Conversations about potentially sensitive topics were more common among low-income adults and adults with health problems. 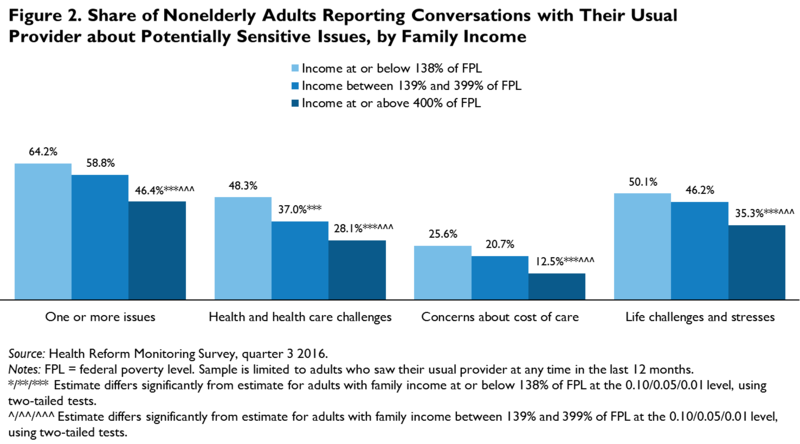 Almost two-thirds (64.2 percent) of adults with incomes at or below 138 percent of the federal poverty level (FPL) reported a conversation with their provider about at least one potentially sensitive issue, compared with less than half (46.4 percent) of adults with incomes at or above 400 percent of FPL (figure 2). 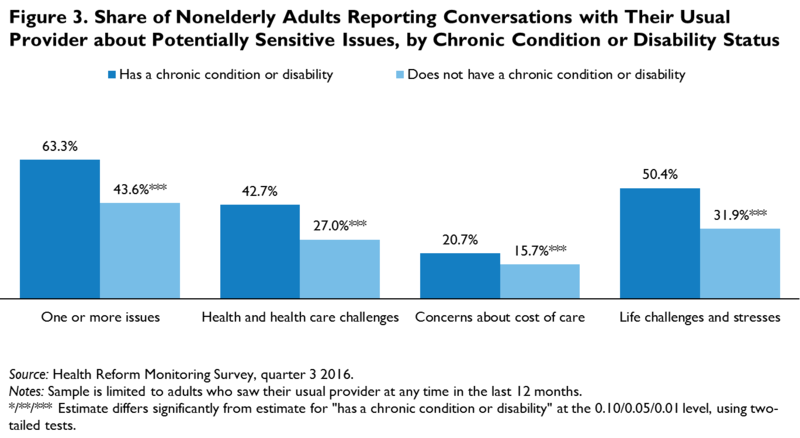 Similarly, almost two-thirds (63.3 percent) of adults with a chronic condition or disability reported a conversation about at least one sensitive issue, compared with less than half (43.6 percent) of adults without such health problems (figure 3). Low-income adults and adults with health problems were more likely than their counterparts to report conversations on each of the three issues, although conversations were still relatively uncommon. Of the three-quarters of low-income adults in the sample who did not report a conversation with their provider about cost concerns, 33.4 percent reported unmet need for health care because they could not afford it, including 16.6 percent with unmet need for doctor care (data not shown). Among adults with a chronic condition or disability who did not report a conversation with their provider about cost concerns, 22.0 percent had an unmet need for health care because they couldnâ€™t afford it and 8.9 percent had an unmet need for doctor care (data not shown). Patient-centered care emphasizes increased patient-provider dialogue about sensitive issues, and many adults report such conversations with their providers. But our results show that some potentially beneficial conversations are not taking place; many adults who forgo needed health care (including doctor care and medical tests, treatment, or follow-up care) because they cannot afford it are not talking to their providers about the cost of care. These findings highlight the need for better patient-provider communication, especially among vulnerable populations. AHRQ (Agency for Healthcare Research and Quality). 2015. About the Patient-Centered Medical Home Item Set 3.0. Rockville, MD: AHRQ. Epstein, Ronald M., Kevin Fiscella, Cara S. Lesser, and Kurt C. Stange. 2010. “Why the Nation Needs a Policy Push on Patient-Centered Health Care.” Health Affairs 29 (8): 1489–95. doi:10.1377/hlthaff.2009.0888. Levinson, Wendy, Cara S. Lesser, and Ronald M. Epstein. 2010. “Developing Physician Communication Skills for Patient-Centered Care.” Health Affairs 29 (7): 1310–18. Long, Sharon K., and Lea Bart. 2017. “Patients Feel Comfortable Talking to Their Providers about Sensitive Issues, but Providers Donâ€™t Often Ask.” Washington, DC: Urban Institute.